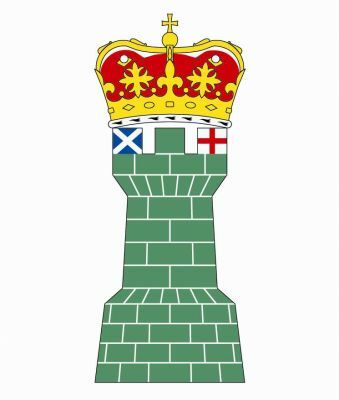 Blazon of the badge: A tower of three castellations Vert, masoned Argent, the dexter castellation Azure, charged of a saltire Argent, the sinister castellation Argent, charged of a cross Gules, all ensigned of the Crown of Scotland Proper. SOURCE, NOTES & CREDITS: Burkes Landed Gentry, 19th Edition, Scotland. Background illustration is from the HSS Society site, Officers of Arms. Text for blazon from pages 78 &79, "The Double Tressure", No. 20, 1998, in an article "Badges of the Scottish Officers of Arms" by Mrs. C. G. W. Roads, then Carrick Pursuivant of Arms. The appointment was noted on Lyon Court site on the date memtioned and in Number 27082 Tuesday 17 April 2012, Edinburgh Gazette. The Hon. Adam Bruce is the 2nd son of the Earl of Elgin. He was promoted from Unicorn Pursuivant of Arms in Ordinary to Marchmont Herald of Arms in Ordinary on 2 April 2012. The artwork is a rendering of John Hamilton Gaylor.